If you need a Panasonic Electronic Filing System KV-F520 alongside KV-F511 Printer Scanner unit ready for file conversion service, then contact our friendly company. 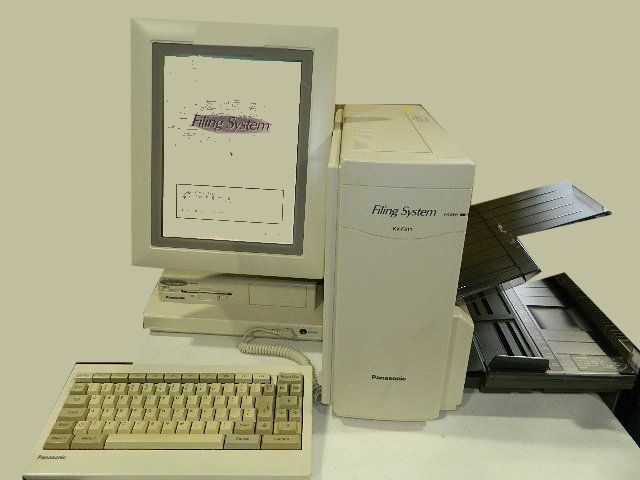 Panasonic Electronic Filing System KV-F520 alongside KV-F511 Printer Scanner unit ready for file conversion. Often used with 90mm or 3.5inch MO disks 128mb, the scanner system was used to store documents to enable easy retrieval. The problem is that now users of the system have found their data locked in to the Panasonic Filing System with no way to transfer them off to a Windows PC or modern computer. When this disks conversion is required, we can convert the MO disks to TIFF or PDF files while maintaining the original folder filing system.